Just a few months ago, Margaret “Peggy” McCue, of Rahway, was in excruciating pain and not able to get out of bed. With help from a SAGE Eldercare home health care aide, McCue is back on her feet and making daily progress. “Everybody thought I was down and out for the count and would never get up again. I was bedridden to now being up on my feet; now that’s a success story!” the 76-year-old said. Due to post-polio syndrome, McCue fell in June while living in North Carolina. She underwent operations and therapy in North Carolina, but wasn’t improving. “Based on what the doctors were saying, I wouldn’t be able to get back up, ever … so I made the move to New Jersey to try something else,” McCue said. Her daughter living in Rahway converted her dining room into a bedroom and the Summit-based non-profit SAGE was hired in December. McCue was paired with SAGE certified aide Schideline Altenor, who she calls “Lin, dear.” Altenor worked with McCue every week day for six hours until February when, due to her progress, her need for an aide was reduced to four hours each week day. They walk around the house together, and Altenor makes her lunch and bathes McCue. “When we began in December, we never imagined her mobility would improve to this point. We are grateful for the role SAGE has played in this,” her daughter, Sue McCue, said. McCue is thrilled to be able to get in and out of bed on her own with the help of a walker after working with Altenor. “She’s always saying, ‘let’s just try’ and ‘do the best you can.’ I would recommend Lin to any friend, she’s very good,” McCue said. She celebrates each milestone of progress, like being able to sit in a wheelchair for two hours and get in and out of her family’s car. This enables her to sit out on the deck when the weather is nice, go to church, and go shopping with her family. Her goals include going to see the movie The Shack, get a stair lift for her daughter’s home, and eventually move into a senior apartment on her own. “All we can do is go step-by-step,” she said. “Nothing makes us happier than to have another success story like Mrs. McCue. 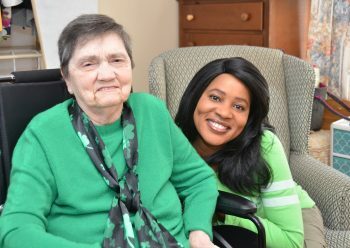 The SAGE Eldercare aim is to always help older adults lead healthier, independent lives at home,” said Angela Sullivan, SAGE’s Executive Director. SAGE HomeCare is accredited by the New Jersey Commission on Accreditation for Home Care and offers a range of flexible personal care services with hourly, overnight, or live-in aides, provided by Certified Home Health Aides and supervised by Registered Nurses, for short-term or ongoing needs. The aides meet a spectrum of needs including personal care, meal preparation, light housework, exercise and therapy compliance, medication reminders, and maintaining a safe home environment. For more information about SAGE HomeCare, please call 908.273.8400. Since 1954, SAGE Eldercare has been helping make the communities it serves amazing places to age. The non-profit organization provides a wide array of information, support, and services designed to help individuals lead the most independent and active lives possible. From helping with errands and delivering Meals on Wheels, to exercise classes, community programs, Medicare counseling, care planning, an adult day health care program, and home health care, as well as the SAGE Resale Shop and Furniture Restoration Workshop, SAGE’s expertise helps older adults remain independent in their own homes. SAGE is committed to being the leading provider of programs and services to meet the changing needs of older adults, their families, and caregivers throughout Union, Essex, Morris, and Somerset Counties. For more information, please call 908.273.5550 or visit www.sageeldercare.org.